Emerald Grain’s parent company Sumitomo Corporation has announced plans to build a new wheat flour mill outside Ho Chi Minh City in Vietnam. Grain trading, marketing, storage and handling group Emerald Grain already exports close to 100,000 tonnes of wheat to Vietnam annually through Sumitomo. The new plant, named CJ-SC Global Milling, will commence operations by May 2015. The mill will manufacture 150,000 tonnes of wheat flour per year for Vietnam and Cambodia, mainly for premium bread and banh-mi bread rolls. Sumitomo has a 49 per cent share in the facility, alongside South Korea’s CJ CheilJedang. Sumitomo Food, Materials and Real Estate Business Unit Head Asia & Oceania Hideki Hijiya said the new mill means new opportunities for Australian wheat growers. Vietnam currently imports around 2.5 million tonnes of wheat per year, mainly for bread and noodle manufacturing. Mr Hijiya said wheat grown in Australia was popular with Vietnamese milling companies due to its white colouring. Mr Hijiya said Sumitomo’s long term strategic plan involves more investment in international food and agriculture businesses. “The growing Asian middle class combined with world population growth means there is a lot of opportunity in agribusiness, food processing and food manufacturing. “Sumitomo’s recent 100 per cent acquisition of Emerald Grain is part of our strategy to be a large player in the food supply chain throughout Asia. “Though Emerald Grain, we can source high quality Australian grain, send it through our processing assets and onto large food manufacturers through Asia and the Middle East,” Mr Hijiya said. Sumitomo acquired 100 per cent of Emerald Grain in February 2014. Sumitomo is an integrated trading house with in 66 countries across the globe. 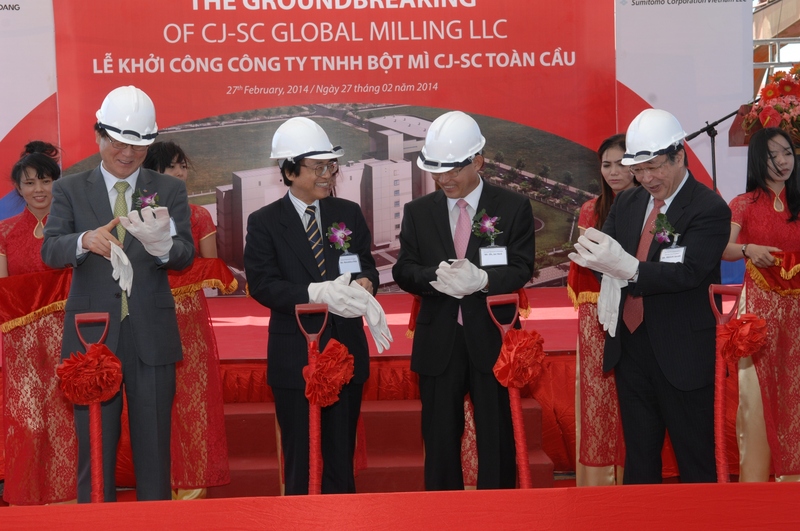 The Ground Breaking ceremony of CJ-SC Global Milling – L-R: President and CEO CJ CheilJedang Corporation Mr Chul Ha Kim; Consulate General of Japan Mr Harumitsu Hida; Consulate General of Korea Mr Jae Hack Oh; and Executive Vice President Sumitomo Mr Shinichi Sasaki.